and add a bit of fun. Because my girls need more sugar. Personally I prefer mine with just a good amount of cold butter. were the result of a pleasant half an hour of labour on Sunday.Just enough for a generous bowlful plus a few extra for Grace. A little beyond the blackberry brambles, there were a few apple trees loaded with fruit, well within our reach. So naturally we did what you do when you have the great fortune to be able to pick your own blackberries and apples just a stone's throw from your own front door. Personally, I think pie tastes quite different when you have picked all the filling yourself. It was all quite story book like except for the fact that I didn't wear a gingham frilly apron for the pie making bit. I'm much more a utilitarian denim apron from Muji type of domestic goddess. Oh, and there was a little bit of swearing when I got stuck in the brambles. I'm pretty sure there is no swearing in story books. But let's just ignore that slight slip, shall we and appreciate a bit of pie goodness. With cream and icecream,of course. knit.....using the 'just in time neck cozy' pattern found here. I used two strands knitted together of the gorgeous Manos del Uraguay silk blend (silk and merino extra fine wool) colour 6461- soft, drapey and with just enough shine. 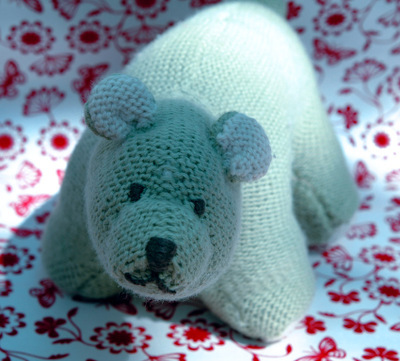 You can knit it up in about two hours and it makes a perfect gift. I think the next one will be for myself in a charcoal grey. soup.....ugly but really delicious. Not only is it quick to cook but it's also good for you, so it ticks all of the boxes. The recipe is one I found attached to a bag of Puy lentils I bought a few years back, which I have tweaked a little. I don't add the cream( why would you?) and I use powdered organic vegetable stock and water. Once the soup has finished cooking, I puree half and mix it back in so that you still have bits of carrots and lentils for texture. My final secret trick is to add the finely zested peel of a lemon which just gives it that subtle kick. Add some good sourdough bread and it's perfect. fun....a friend took this very cute photo of my three girls...Grace playing the clown as usual. As for the hair, well remember this? All I need is the kooky hat and a few oompah loompahs running around. A simple, no fuss recipe - wooden spoon,one saucepan and into the oven. Spicy Ginger cake with citrus icing. Enjoyed by all, big and small. No, I haven't finished Charlotte's cat but in the meantime here's a panda bear that I did manage to finish for her last year! I am in serious nesting mode, if the amount of baking and freezing I am currently doing is any indication. That and I have developed a hankering for serious comfort food. This week is biscuit week or more correctly cookie week. A year spent working for Mrs Fields, a long, long time ago when they still mixed up the cookie dough from scratch ( not that awful frozen dough stuff they serve up now) has honed my cookie making skills to perfection. No under baked grey sunken cookies here or rock hard overbaked ones either. Just right semi sweet choc chip ones or tonight's batch of cinnamon cookies.Some for now and the rest frozen for later when I have neither the energy or inclination to cook. 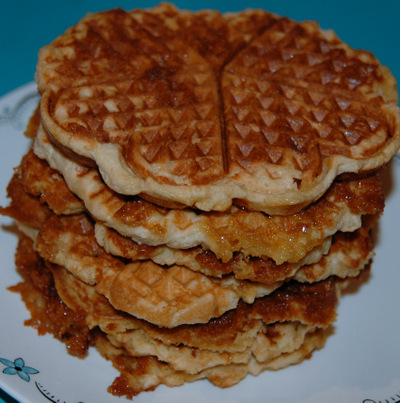 It took me ages to find just the right recipe for a Belgium style yeasted waffle (makes a stiff dough rather than a batter) but I did and they were delicious. So much butter and sugar though that I can only really make these for a very special treat.The girls like theirs with melted chocolate on top because you really need just a bit more sugar! On the baby front...well, it looks like she will arrive sooner than later as I have not really gained any weight in the past four weeks. At the hospital twice a week now for heart rate and movement monitoring which is showing that she is still doing well and not in any distress. I had to have steroid shots this week which will help mature her lung function a little faster just in case it is necessary to delivery her early. Off for another scan to check all functions next Monday and I guess we will just take it from there. On our visit to Cape Tribulation we stopped in at the Daintree Icecream factory.Although there didn't seem to be anything vaguely resembling a factory ( unless you count the tiny tin shed hidden behind a grove of trees) there was a small kiosk selling icecream made the from many different varieties of exotic fruit growing in the surrounding orchard. 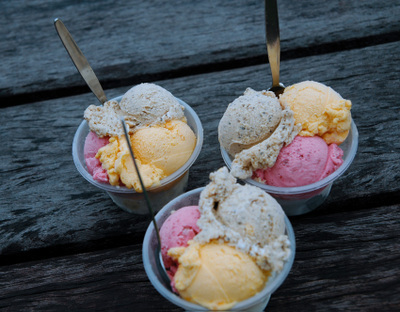 The good and bad thing was that you couldn't choose the flavours - the only way they sold it was as four mixed scoops in a cup. If that hadn't been the case I would never have discovered my passion for yellow sapote icecream or my dislike of the soursop variety. 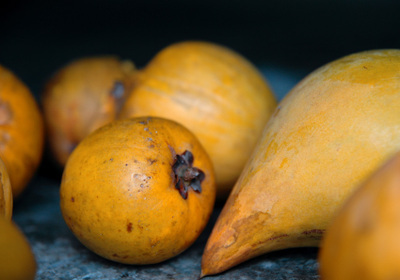 Jackfruit was quite tasty and the wattle seed (along with the yellow sapote) was one of my favourites. 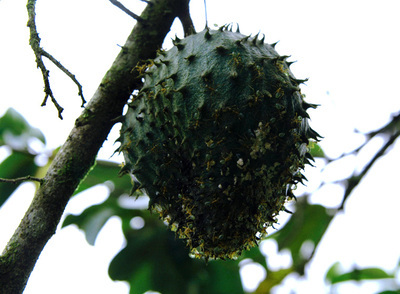 I'd probably prefer to do that than have to eat the soursop icecream again...perhaps the ants might beg to differ?!!! 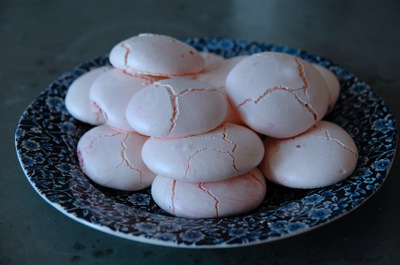 I was so taken with Miss Marzie's beautiful pink meringues that I decided to whip up a batch myself.....after all the recipe said that they were easy to make...and I love a no fail recipe. Instead of a plate of heavenly pink piles of goodness,I ended up with a plate of cute pink buttons. I don't think it helped that I was cooking dinner for the girls while talking on the phone and mixing the meringues. And I don't think that the fact that I forgot to add the 4 tablespoons of boiling water until halfway through whipping them up ,helped either. Oh, and I was a little impatient with the whipping up bit and decided it look stiff and glossy enough. When I heaped the little mounds on the tray and then watched them flatten into pink puddles , I decided to scrape it all back into the bowl and keep on beating the mixture. Probably didn't help much either.It did in fact get stiffer and glossier but still refused to sit in little mounds. I baked them anyway and really, they tasted great! Next time, I need to concentrate! At least Miss Marzie can feel safe about her Queen of the Meringues title. Did anyone pick up the hidden random fact about myself in yesterdays 'tagged" post? I have a pack of postcards for the first person who can work it out. I will give you the answer tomorrow if nobody beats me to it! well that was quick...2 minutes after this post to be exact! How about that,Bianca must be a U2 fan as well...a pack of postcards is on its way to you!